The Pac-12 is known as a conference full of high powered offenses and that starts at the quarterback position. In 2014, the Pac-12 boasted Heisman Trophy winner Marcus Mariota but the conference was very deep in QB talent. Cody Kessler, Brett Hundley, Sean Mannion, Connor Halliday and Anu Solomon are just some of the names you should be familiar with if you follow college football. Mariota, Hundley, Halliday, Mannion and Taylor Kelly move on this year but the Pac-12 is still arguably the best conference in the Nation at the QB position. Let’s take a look around the league at this years crop of gunslingers…. As a freshman Anu Solomon took the conference by storm but somewhere along the way he hit a brick wall and struggled down the stretch. Injuries attributed to Anu’s slide towards the end of the season and that will hopefully show him the need to be a more well-rounded quarterback in 2015. Mike Bercovici stepped in at times during the 2014 season for Taylor Kelly and did a commendable job. Bercovici completed 61.8% of his passes and had a TD:INT ratio of 3:1. Bercovici should excel in the Sun Devils offense this year, which Todd Graham is molding to fit Bercovici’s strengths. Jared Goff has a huge arm and he’s back for his third season behind center for the Golden Bears. In 2014, Goff improved his completion percentage, his yards/attempt and his TD:INT ratio. Unfortunately for Cal, they still missed going bowling at 5-7. With an NFL future in his sight, this could be Goff’s last season at Cal. Outlook: Continued improvement, but is it enough? Buffs QB Sefo Liufau saw improvement from 2013 to 2014 but the defense allowed Colorado to win just two games. While he was put in a no-win situation at times last season, he still has to be more careful with the football (15 INT in 2014). Can Liufau take the next step this spring and summer? How do you replace a Heisman Trophy winner? You go down to the FCS level and grab a player that has thrown for over 10,000 yards and 100 TDs in his three year career at Eastern Washington. This might sound like a gamble and in a way it is but Vernon Adams has had success in the Pac-12 before. In 2014 he threw for 7 TDs against Washington. While Adams won’t be as experienced as Mariota in the offense, there won’t be as big of a drop-off as might be expected. For the last two years, Sean Mannion has basically been the only QB the Beavers have known. With his exit, who will step up? Alabama transfer Luke Del Rio threw 18 passes last season and could be next in line but there are multiple options as the Beavers have seven QBs on the roster and a new head coach that is going to want to take a long hard look at these options. Coming into his redshirt senior season there were rumors that Kevin Hogan might transfer out of the program as a graduate transfer. Hogan has decided to stick it out and he will be back to lead the Cardinal and their vanilla offense. A concern for Stanford is that outside of an increase in completion percentage (of course, there was also a drop-off in yards/attempt), Hogan hasn’t really improved and that leaves Stanford in a familiar position. They need to win with their defense and running game. Over the last three years the Bruins have been in good hands with Brett Hundley but now they must turn the page as Jim Mora will be coaching his first Hundley-less season. Last year Jerry Neuheisel saw action but is he the best fit for the team long-term? Neuheisel will probably start at the beginning of the year but remember the name Josh Rosen. He could be the future of the program. 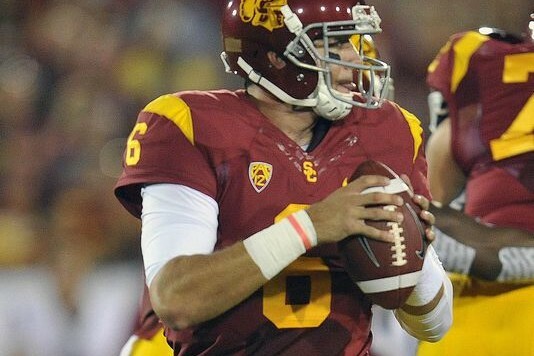 People know who Cody Kessler is but they don’t know just how good he was last season. In 2014, Kessler led the Pac-12 in completion percentage (69.7%), threw for 3826 yards and had an amazing TD:INT ratio of 39:5. The loss of his favorite target Nelson Agholor will hurt but Kessler is a legit Heisman Trophy candidate for 2015. Travis Wilson has grown immensely during his tenure at Utah but is he ready to take the next step for the Utes in 2015 or will Kendal Thompson grab the reigns? Against ranked opponents in 2014, Wilson completed just 56% of his passes and threw 5 TD vs 4 INT. If Wilson is the man, and it looks like he will be since Thompson is out this spring with an injury, he needs to take another step forward this year. Cyler Miles wasn’t bad as the starting QB for Washington last year but with him under center the Huskies failed to win any of their big games (0-3 as a starter against Top 25 teams) and also went out with a whimper in their bowl game. Lack of decisiveness and inability to throw the ball down-field (UW was dead last in conference for passing plays over 30 yards) plagued Miles last year and that has rumors swirling about the status of his starting position. If Miles is replaced, look for Jake Browning to get a chance. Connor Halliday was on his way to a fantastic 2015 when his season abruptly came to an end. Luke Falk replaced him and got a four game audition. Falk put up over 1,800 yards through the air in the last four games but also put up a 5:6 TD:INT ratio in the final two games of the season. It looks like the job is the former walk-on’s to lose in 2015 but will he win the job by default?